Located in the Quan Hoa and Ba Thuoc Districts of Northern Vietnam, Pu Luong Nature Reserve comprises 43,643 acres (17,662 hectares) and one of the largest swathes of limestone mountain forest remaining in the nation. The park attracts eco-tourists from around the globe with its incredible biodiversity: nearly 600 species of fauna, including the second largest population of Delacour’s langur in Vietnam. While many visitors come – and rightly so – for the spectacular natural scenery and wildlife watching, the two mountain ridges that make up the reserve also sandwich a valley of agricultural land where a Thai ethnic minority live. In Hieu Hamlet, visitors can see traditional Thai water wheels, verdant rice terraces and traditional stilted houses. Homestays with local families living in the valley are also an option. Pu Luong Nature Reserve is located 112 miles (180 kilometers) from Hanoi. Be part of the Mai Chau Pu Luong 3 days tour will provide an exciting experience. Exploring the Off beaten track of Pu Luong Nature Reserve, hard trek through terrace rice paddies, jungle and remote rural villages, swimming in the waterfall in the Reserve. Visit the Mai Chau valley and Pu Luong Nature Reserve on a 3-day tour of northern Vietnam. You’ll embark on a bike tour past working farmers and ride a motorcycle to Pu Luong where you’ll trek with your guide to a limestone cave. Enjoy a garden party with barbecue dinner and local wine while you watch a traditional dance performance. Choose overnight accommodation in a communal stilt house or upgrade for a private bungalow with a garden or valley view. This is a perfect combination to discover 4 different attractions in a short time. You will start by fantastic valley of Mai Chau and the Pu Luong Nature Reserve. Nature lovers will appreciate the peacefulness of the site. The hidden Pu Luong Nature Reserve where some trekking will bring you closer to the minorities. Contemplate stunning landscapes with beautiful rice field terraces and learn about the daily life getting closer to the locals. Then, spend a day in the surprising Halong Bay in land, Ninh Binh. Learn about the history and enjoy a boat ride in the famous Trang An in between huge karst pics and passing through natural caves. Finally, you will discover the unspoiled Lan Ha Bay boarding the fantastic Serenity cruise. A perfect deal between luxury and adventure to navigate in this unspoiled bay. The lush countryside and traditional villages of the Mai Chau Valley lie around three hours southwest of Hanoi. This extended tour lets you explore further and immerse yourself in local culture during a homestay experience in a traditional stilt house. During your stay, enjoy trekking in the Pu Luong Nature Reserve, cycle around the villages and rice paddies, visit 1000 Step Cave, and learn more about the White Thai and Muong people. Located on a hillside, divided in three layers, Pu Luong Retreat guarantees you a stunning view from every corner of the Retreat.Bringing the rice field and farm activities up close to your very own eyes.Plenty of old tress and a full green coverage.Buildings that are designed to disappear in nature.A nice stream floating, watering the area and offers the amazing sound of the water gurgling its way down in summer.Discover Pu Luong Nature Reserve as you stay in a cosy retreatExplore the wild nature, cross suspension bridges, find the water wheels and raft the riverGet up and close to local life in the countryside. Mai Chau is a popular destination in Vietnam, we will still give you the chance to visit the main tourist sight but then go to the less touristic Pu Luong Nature Reserve. You will go on a pleasant trek to visit different villages where you may be the only Tourist in the whole area. 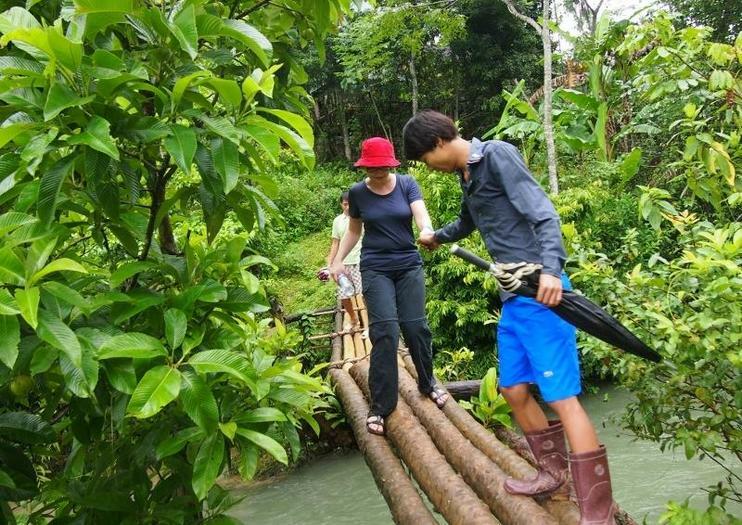 Trek through the stunning terrain of Pu Luong Nature Reserve with your own professional guide on this 3-day private tour from Hanoi. Hike through forested mountains with craggy limestone cliffs and terraced rice fields on an eco-adventure that also visits local villages. Stay overnight in traditional stilt homes for two nights, ensuring an immersive cross-cultural experience with northern Vietnam's ethnic minorities. Enjoy a great combination of natural beauty and traditional culture, with meals and round-trip transport by private vehicle included. Our tour of Indochina was a sensational, special, memorable journey. Beautiful, exciting and fascinating, it’s a great destination. Mai Chau is a nice and peaceful valley, lying among the picturesque terraced fields and surrounded by majestic mountains. With Mai Chau - Moc Chau Arena 3 days 2 nights, you will have grind look about the tranquil, simple and quiet life in Mai Chau, the unique stilt houses and the diverse customs and culture of White Thai people.Moc Chau is the largest and most beautiful plateau in the north, with temperate climate, famous tourist destinations such as Doi Cave, pine forest in Ang village, Dai Yem waterfall, tea plantation. In the season of blossoming flowers, coming to Moc Chau, you will feel like getting lost in the land of flowers. Even along the way, wild flowers also race to bloom. In spring, apricot flower, plum flower, peach flower bloom. In March and April when plum blossom, peach blossom have faded, throughout the mountains of the Northwest forest, "ban" flowers whitely bloom. In winter, wild sunflowers make all area become yellow. Join this 3-Day tour for the opportunity to cycle through a spectacular nature reserve, ethnic villages, rice paddies of Mai Chau and Pu Luong. Grab at the rare opportunity to visit and stay with locals at the Thai guesthouse. Plus visit the UNESCO World Heritage site of Trang An. The Pu Luong limestone landscape is an area of outstanding beauty, culture interest and high biodiversity value stretching from Mai Chau in the North to West to Cuc Phuong national park in the South East. It is blessed with rich forest, limestone panoramas, magnificent rice terraces and breathtaking scenery.Pu Luong becomes a great destination for a few day trips from Hanoi. Trekking in the forest and a long rice paddy fields, cycling through the reserve and visit many beautiful small villages are among the activities travelers like. Pu Luong is among a few "off the beaten path" places near Hanoi that receives recommendations from explorers recently. Be part of the Mai Chau Pu Luong Ninh Binh 4 days tour will provide an exciting experience. Exploring the Off beaten track of Pu Luong Nature Reserve, hard trek through terrace rice paddies, jungle and remote rural villages, swimming in the waterfall in the Reserve. Cycling to visit the First Vietnamese Capital in Ninh Binh and enjoy the boat ride in Trang an. Experience local life in rural Vietnam on this overnight homestay adventure from Hanoi. Escape the city to explore the Poom Coom village of Mai Chau, tuck into a traditional dinner with your hosts and spend the night in a typical Vietnamese stilt house. That’s not: you’ll also have chance to trek through the Pu Luong Nature Reserve, passing lush rice paddies, hill tribe villages and bamboo water wheels. Accommodation, meals and round-trip transfers from Hanoi are all included. Every rider and group of riders is different. Some, having only recently started riding, prefer a relaxed pace with plenty of breaks; others, often seasoned riders, love to challenge themselves in tough conditions and on difficult terrain. Some like to pause often to refresh themselves and take plenty of photos; others already have a Gopro strapped to their helmets and are looking to keep up the pace. We make a point of understanding what you're looking for out of your motorbike tour, viewing each tour as a collaboration. Experience four scenic days in the Mai Chau valley with guided treks through Phu Luong Nature Reserve, home to villages belonging to Vietnam’s ethnic minorities. Hike off the beaten track along moderately strenuous routes and mountainside trails to several villages, where you’ll stay overnight in traditional stilt houses. Take a motorboat ride on the Ma River and enjoy locally provided meals. Ne manquez pas l’occasion d’intégrer ce tour pour rejoindre la Réserve Naturelle de Pu Luong et découvrir ce qu’elle a de plus beau à offrir. Randonner hors des sentiers battus à travers les forêts peu touristiques et des rizières en terrasse fabuleuses; rencontrer les ethnies minoritaires Muong dans leur maison sur pilotis; relaxer au bord de la piscine au milieu de la nature ou contempler le lever du soleil à partir de votre chambre de Pu Luong Retreat sont les point fort de circuit. SMALL GROUP TOUR TO PU LUONG NATURE RESERVE & NINH BINH (4DAYS 3 NIGHTS)Pu Luong-Ninh Binh The Trip 4 daysLocation: Ha Noi – Pu Luong – Hieu waterfall – Ninh BinhDuration: 4 Days – 3 NightsThe Pu Luong-Ninh Binh tour is the perfect choice to discover two beautiful places of Vietnam. Pu Luong reserve is an authentic place unspoiled by tourism. Minorities in Pu Luong (as Black Thai) live from agriculture. Trekking through the villages will offer you the chance to meet them, discover their culture and daily life, learn about their agriculture system (especially the waterwheels system). The nature in Pu Luong is intact and swim by a waterfall in the middle of the jungle is an amazing experience that this tour provides to you. Then, in Ninh Binh , another part of the culture and Vietnamese history will be introduced to you visiting the Ancient Capital Hoa Lu. After lunch, you will board a boat to discover the Halong Bay on land, Trang An. Pu Luong Natural Reserve has preserved a primitive landscape and plentiful and diversified flora and fauna. With the terraced rice fields, pristine mountains, the villages of wooden houses on stilts nestled in the foothills is a promising region for travelers having passion for exploration. Mai Chau valley with the villages of Thai people living in wooden houses on stilts under new colors. For everyone, Mai Chau hides still things that you have to stop to discover them. Where you will see many mothers sitting to take care of work of weaving, the men carefully carve crafts.